The end has finally come to the long, dark and cold winter here in Chicago and summer is emerging. In celebration of the warm weather (and in between making pots), I’ve been spending a lot of time outside, soaking up the sunshine. A couple of weeks ago, Ian and I took a road trip to Minnesota to visit his family and to do the Saint Croix Pottery Tour. It was a great weekend, and we came home with quite a few pieces to add to our pottery collection. Ron gave me one of his wonderful tea bowls as a gift. Since our return, the bird cup has been spending lots of time outside on our porch. Our porch is a happy space that is filled with flowers, herbs and veggies; a colorful rug; lots of places to lounge, strings of bright white lights; and a swing for our nephews to hang out on. It’s our happy little urban oasis. 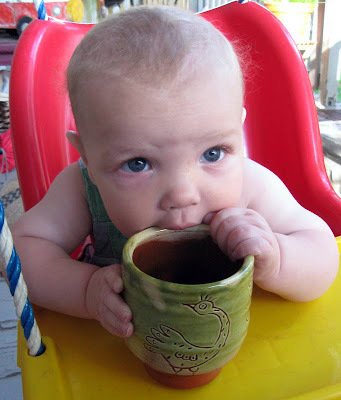 Here is our 6 month old nephew, Shiya, enjoying Ron’s cup last weekend while hanging out in the swing: Next up on the porch tour is a great big tumbler that we picked up from Matt Metz. 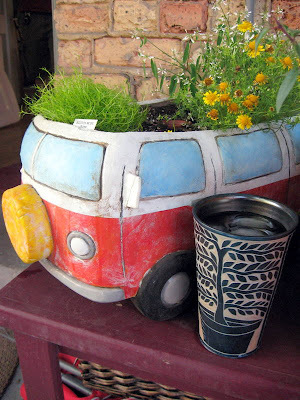 It’s hanging out in front of this fantastic VW bus planter. My friend Dave Trost made an incredible series of car sculptures a couple of years back. The roof of this bus cracked off during the bisque firing. He gave me the remains, and Ian painted it, polished it with wax and now it lives on our porch filled with flowers and moss. 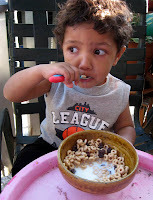 Shiya’s big brother, 2 year old Ayrie, enjoyed Cherrios and raisins out of a Jordan Taylor cereal bowl. Drinking the milk from the bottom of the bowl is an important part of the cereal eating experience for Jordan, so he makes them with a “drinking lip” that Ayrie is happily taking advantage of. Last week was the final week of classes for the spring session at Lillstreet. A Lillstreet tradition is that each class has a potluck and critique on the last class of the session. My soda class decided to go all out this time around and have a bbq. The day was glorious and a great time was had by all. 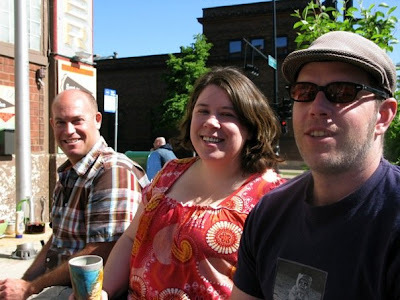 Below is a photo of Gary, me and Mike during the festivities out front of Lillstreet (taken by Greg). We grilled out on this little patio that’s outside of Lill’s front door. 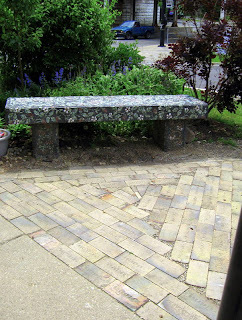 There are gorgeous greens and flowers, a big mosaic bench and a brick patio that is made up of firebricks from the old soda kiln. Seemed like an appropriate place for the soda class to hang out! Last week was my last week of teaching until fall. I’m taking a short hiatus from teaching for the summer so I can focus on making pots and spend time traveling with my sweetie. We have several family trips planned in June and July, and then we’re heading to Europe in August. I still need to work on the concrete plans over the next couple of weeks, but our basic plan is to visit Germany, Denmark, Norway and Holland. If you have any suggestions for places to visit, please pass them on to me (especially clay focused things to do and see). I hope you’re enjoying the sunshine in our corner of the world! This is something that I had to share with all of you…. A couple of days ago I got an email newsletter from my friend, Jordan Taylor. He shared news of a new show of sculptural work which I am excited about. He also announced of a local Empty Bowls project that is being held in Scranton, PA on May 4. This particular Empty Bowls fundraiser is one that Jordan is donating 1000 bowls to. I’m blown away yet not surprised by his incredible generosity. Meals on Wheels will host an “Empty Bowls” dinner May 4, 2008 1-3pm at Marywood University, Nazareth Hall, Multi Purpose Room (formerly known as the Crystal Room). A $10 donation will purchase a bowl of soup, and you get to keep the bowl. The bowls, consistent with Taylor’s work to date, are wood fired, made largely from materials gathered and processed locally, and are microwave-dishwasher-oven safe, lead free, and non toxic. Each bowl is individually decorated by a different Scranton area art student. Contact MOW Scranton director Linda Steir 570-346-2421 mow110@hotmail.com for inquiries. Taylor had participated in several “Empty Bowls” events by donating and by dining before becoming interested in staging an event in Scranton. In 2006 Taylor was a visiting artist at a “Craft and Social Conscience” session, run by one of the founders of the Empty Bowls Movement, at the Penland School of Crafts, NC. Taylor’s experience at that session inspired him to reach out to the MOW chapter in Scranton. I’m truly inspired. But I have to remind myself that it’s important to act on the inspiration and put it into action. This week I plan on calling my friend, Joanna Kramer, who organizes Chicago’s Empty Bowl project to see how I can be more involved this year. Our event isn’t until December, but it seems like the perfect time to start making bowls! I’m curious to hear about other Empty Bowls fundraisers out there. Have you organized or participated in one? What was your experience? I love that Jordan made the bowls but students decorated the pieces. 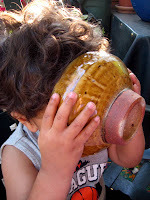 Have you done an interesting twist on Empty Bowls? Are you in Chicago and interested in joining us? Just leave me a comment below! This is a little trick that I picked up from my friend Jordan Taylor for throwing platters. I find it extremely useful so I thought I would pass it on to all of you and maybe you’ll find it useful too. It helps you more easily judge the thickness of the floor of the platter and adds consistency if you’re doing multiples. And it allows you to compress the floor of the platter REALLY well so you don’t have to worry about any future problems of cracking. Wedge up and center your first lump of clay. This piece is going to be the floor of your platter. I used 8 lbs of clay which gives me a slightly narrow but thick foot (great for putting holes into so you can hang it). You can vary the weight depending on the ultimate size of your platter. But I find that the 8 – 9 lb. range works for a variety of sizes of platters since the size foot isn’t necessarily that different. Center your clay and compress the heck out of the floor. Place a quarter in the center of your centered clay (I use a 1974 quarter). Wedge up your second piece of clay and place it on top of the quarter. I tend to use between 8 – 12 lbs. of clay for this second piece, depending on the ultimate shape of the platter. Open up the platter and establish the curve. Then finish off your platter as usual and be aware of the thickness of the floor. This platter isn’t actually the platter that is throw above. That platter is sitting in my studio waiting to be trimmed. But this platter was thrown in the same way. This is the first post written by a “guest blogger.” Thanks to my friend, Jordan Taylor for sharing his words. I took these photos in June when I visited Jordan at his studio. When I’ve been firing for a long time the boundary between nighttime wakeful stoking and feverish fitful sleeping is thin. As far as I understand neuroscience, we are not wired to remember pain. I have memories that I felt pain but I have difficulty recreating the sensation simply by recalling the painful incident (the exception for me is the pain of embarrassment, which I will torture myself with for any minor faux pas at a party). Alternately I can remember moments of pleasure, culinary or otherwise, quite well, and will replay such moments with even more enthusiasm than when I torture myself with my own embarrassment. Pain, similarly, is present only as an abstract concept, if even that, in my dreams. The evisceration stoking was pain free without anesthesia. In dreams, as in memory, we are blessed with the ability to remember what causes us pain, but not the pain itself. Both of my last two firing have happened since my daughter Greta was born (our first, at the time of this writing she is nine weeks old). The feeling I get when my wife is on shift and I bring Greta out to her to nurse by the kiln is echoed by watching a field mouse scamper up to a stone ledge in my kiln buttress to eat from a bowl of raw honey I’ve placed there as an offering. The combination of a being so small and vulnerable in such unknowing proximity to temperatures catastrophic to their state of being, going about the daily ritual of sustenance, moves me in a way that I would prefer not to try and put words to. Psychologists (armchair and otherwise) reading this may already see where I am going with this: that I repeatedly return to the source of my grief and pain hoping it will heal and nurture me anew. Like an infant, I can’t say why I need what I do, just that I need it. Unlike an infant I can say a word or two about what risk in my studio life does for me: it sets me free. It sets me free from simply executing expectations, each risk allowing for, requiring, another layer of developmental growth. My good friend and fellow Earlham alum Jordan Taylor, is going to be coming to Lillstreet Art Center this April to do a 2 day workshop. Jordan and I worked side by side on our senior projects at Earlham, making pots, loading and firing kilns. After we graduated, Jordan and I have both gone on to make pots full time- but we have arrived there by very different paths. Jordan went the route of many the clay graduate of EC, and did a long apprenticeship. 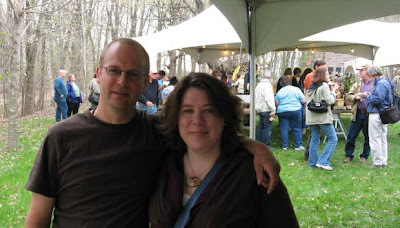 He worked with Mark Skudlarek in Cambridge, Wisconsin for 3 1/2 years. 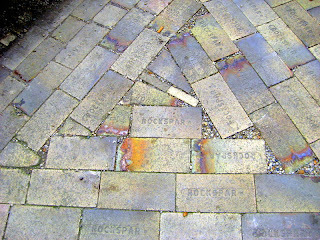 After his apprenticeship was completed, he moved to north eastern Pennsylvania to set up his shop. 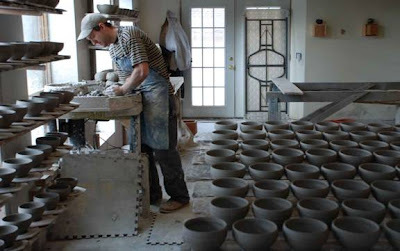 He wrote an article for Ceramics Monthly about his journey of making pots. If you are interested in registering for this workshop, it’s on April 16th and 17th — contact Lillstreet Gallery for more information (773.769.4226).